Admit it, we all opt for saving schemes to build retirement corpus with optimum tax benefits. Same applies to National Pension Scheme. When it comes to tax saving schemes, NPS always stand out with its exceptional tax benefits. Today, we are going to review old and latest updates about NPS tax benefits. People frequently ask about tax treatment at maturity; we will touch this section too. In short, we will show how investment in NPS makes sense! Claim Tax Benefits Via National Pension Scheme! Before we move, be clear about one thing! Tax benefits are available for contribution towards Tier-I NPS account only. If you want further information about Tier-I account, please check this guide on National Pension Scheme. It means, the information stated below is applicable for Tier-I account only. NPS investment up to Rs. 1.5 lacs is taxable under Section 80CCD(1). A tax deduction applies to an overall ceiling of Rs. 1.5 lacs under Section 80C. If you are the employee, this tax deduction will be applicable for 10% of your salary (basic + DA). In case you are a self-employed subscriber, the deduction is applicable for 10% of your gross income. The annual investment up to Rs. 50000 is eligible for deduction under Section 80CCD (1B). This deduction will be made over Rs. 1.5 lacs, that is a ceiling limit. Employer’s contribution up to 10% of salary (basic +DA) is taxable under Section 80CCD(2). Only employees can avail this tax benefit. This deduction is not available for self-employed subscribers. For sure, you are still confused about tax benefits. Let me say it in simple words. Your investment up to 2 lacs is eligible for this tax exemption. The tax benefit on employer’s contribution is additional to the benefit above on employee’s contribution. The real attraction about NPS is tax benefits at the time of withdrawal. No other saving scheme comes with such tax relaxation. You get maximum tax relief if you make the withdrawal after retirement. First of all, you need to utilize at least 40% of a corpus to purchase the annuity. Remaining 60% of a corpus is free for withdrawal. Now here comes the real deal, 40% of NPS corpus is exempt from tax at the time of retirement. So, if you withdraw 40% of a corpus, it is going to be free from tax. Do you know that amount used for an annuity is also exempt from tax? This is commendable. But you have to pay a marginal amount of tax on pension in the year of receipt. Now a question arises what you should do for maximum tax saving. You must withdraw 40% of a corpus and invest 60% of corpus in the annuity. This way, at the time of retirement, you don’t have to pay a single penny for tax. However, the minute amount of tax will be charged on a pension at the time of receipt. First thing first; don’t go for pre-mature withdrawal unless you need it badly. I don’t encourage anyone to make the withdrawal before retirement. Otherwise, there is no point of building the retirement corpus. Coming to the point, in the case of premature withdrawal, 80% of the corpus has to be invested in the annuity. You are allowed to withdraw only 20% of the corpus, and it is exempt from tax. The 80% amount invested in an annuity is also exempt from tax deductions. However, the pension income is taxable when you will receive it! If the deceased was a government employee, the nominee can withdraw only 20% of the corpus. Rest of corpus will be invested in the annuity.Both amounts will enjoy tax benefits. But pension is taxable at the time of receipt. But in a case of the self-employed subscriber, the nominee can withdraw accumulated corpus with tax exemption. Final Verdict | Why You Should Invest In NPS? 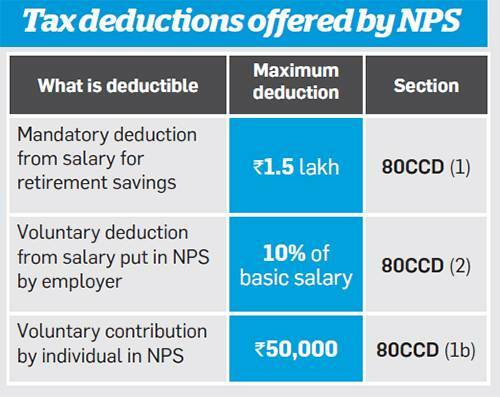 Undeniably, NPS has attractive tax benefits. But we cannot ignore its rigidity on withdrawals. As government employees has to purchase annuity irrespective of the needs. So, the bottom line is that if you are comfortable with withdrawal limitations, NPS is an ideal saving scheme with optimum tax benefits! In case you have any question about NPS, please feel free to ask via comments!